It's no secret that I love the language system, Minspeak, that comes with the PRC device. If accessibility wasn't the issue we would have grabbed one of these up 2 years ago. 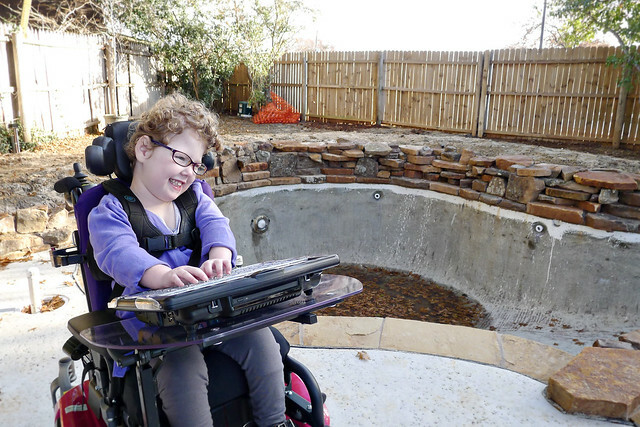 The first time we sat down with Caleigh, using the eyegaze, she was frustrated and it didn't work. The next time we tried it we were alone, calm and tried for 20 minutes. The device was registering her eyes, but her glances are just too quick for any choice to be made. The Tobii was much better in this regard, but it lacks the language system we love. A keyguard was ordered, the eyegaze system was removed and Caleigh started using the ECO2 on her wheelchair tray with 45 single hit choices laid out in front of her. It's not perfect. She has accidental hits. She repeats the same thing over and over trying to get her point across. The device isn't in the perfect position on the tray. Even with it not being "perfect" just yet, she is totally using it appropriately. The good news is that we know our daughter. We know when she's being bossy, sarcastic or seriously needing something. Caleigh says she likes it, which is huge for our iPad loving child. On one of the first days Caleigh used the device, I asked her if there was anything that she always wanted to say that was never on her iPad. She paused for a moment, hit "you" and then went to the pages section, she found a category with words of affection, then hit "you are" "pretty." I'm not even going to lie here, I might have choked up a bit or a lot..... It just seemed like a pinnacle moment. It's hard to explain to someone that has never seen the device, exactly how you can say hundreds of thoughts with just 45 keys, but apparently it can be done. If you watch the documentary "Only God Could Hear Me" you will be able to understand the hieroglyphic system a little more in depth. The goal for this week is to customize it a little more for her now that we know she can access the 45 keys. Her excitement has waned a bit without the customization. We will also start talking about funding, mounting systems, what the rules are and if this is really the device for Caleigh. The video below was taken on Christmas Eve. Caleigh has a sarcastic humor about her, which I assume most children might. You ask them to do one thing and they do the opposite while smiling at you. That's Caleigh. Some of her responses are that humor and some are accidental hits. After watching the video, I realize that I need to cut down on the number of times I make a request. Something for me to work on. Side note here -- apparently my Texas twang really comes alive when hanging out with family on holidays. Something else to work on!